﻿ What is the Alternative - Specialist Lending? What is the Alternative - Specialist Lending? As we have written previously within our ‘What’s the alternative series’, traditional assets such as government bonds appear structurally challenged as an effective source of long term return. We believe there are a number of options to improve on this lacklustre outlook. One is in the specialist lending market where yields are much higher than in conventional fixed income. This sector, which forms part of our real asset universe, is a broad and diverse opportunity set, including private credit, direct lending, mezzanine finance, asset-backed securities, structured credit, trade receivables and infrastructure, property and other real asset focused debt opportunities. The market has evolved significantly since the Global Financial Crisis, primarily due to banks retrenching from lending activities. This has been caused by lower risk appetite due to regulatory pressures, ongoing ‘balance sheet management’ and a focus on resolving non-performing loan books. This has given rise to a variety of other liquidity providers, such as institutional investors or direct lending businesses providing capital at attractive rates. 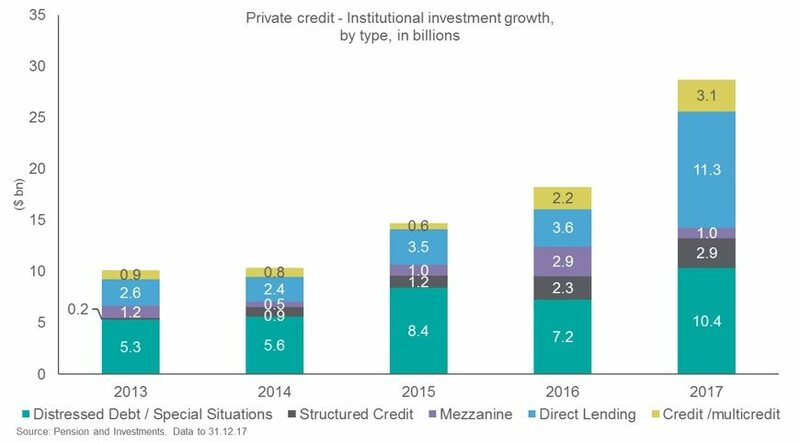 It is difficult to get precise numbers on the scale of the market and growth in alternative sources of debt financing, but the chart below shows how the market has grown significantly in recent years. The growth in the market has also been accompanied by an increase in the ways investors can access the opportunity set. Our preferred route is the closed end company structure and it is interesting to note how this universe has evolved over the last five years. The charts below, courtesy of Jefferies and the AIC, show that nearly 50% of the current investment company universe is made up of ‘Alternatives’ versus under 20% at the end of 1999. Investors increasingly recognise the benefits of the closed end company structure to access alternative investment opportunities and harvest a yield premium. Importantly, in periods of stress, given the fixed capital base, investment companies will not be forced to sell underlying portfolio holdings to meet redemption requests. This makes such vehicles the best means to access specialist lending opportunities which are generally illiquid. With regards specific specialist lending opportunities, real estate offers attractive risk and reward characteristics. Traditional lenders have been focusing on prime lending opportunities thanks to regulatory capital rules and credit policy constraints. This has resulted in opportunities for alternative lenders within mezzanine financing, development and one-stop whole loan financing solutions across a diverse cross section of the commercial property market. Another attractive area is lending to a variety of social and economic infrastructure sectors such as healthcare, energy, transportation and renewables. These businesses operate in sectors that meet a structural demand for essential goods and services. The long term, regular cash flows generated make them an ideal asset against which to secure lending. Finally, the direct lending market is arguably the asset class within specialist lending which has attracted the most capital. Banks have withdrawn from lending to large parts of the SME* and consumer market. These areas are rich in opportunity for alternative lending. Clearly, any exposure to these markets has economic cyclicality, which represents a key risk to monitor and the industry has yet to witness a full business cycle. But access to a diversified pool of loans from a direct lending platform offers another attractive risk reward proposition. The initial yields currently available and total returns available to investors can vary significantly depending on the asset exposure, credit rating of the borrowers, the seniority of the underlying loans and the use of leverage by the underlying manager. But this is much like any traditional credit investment. Currently ungeared, initial yields for specialist lending ranging from low to high single digits and some opportunities have double-digit total return potential. This is an alternative to traditional fixed income that we believe will be of great interest to investors in today’s market. The views and opinions expressed are the views of Waverton Investment Management Limited and are subject to change based on market and other conditions. The information provided does not constitute investment advice and it should not be relied on as such. All material(s) have been obtained from sources believed to be reliable, but its accuracy is not guaranteed. There is no representation or warranty as to the current accuracy of, nor liability for, decisions based on such information. The information relating to ‘yield’ is for indicative purposes only. You should note that yields on investments may fall or rise dependent on the performance of the underlying investment and more specifically the performance of the financial markets. As such, no warranty can be given that the expressed yields will consistently attain such levels over any given period.